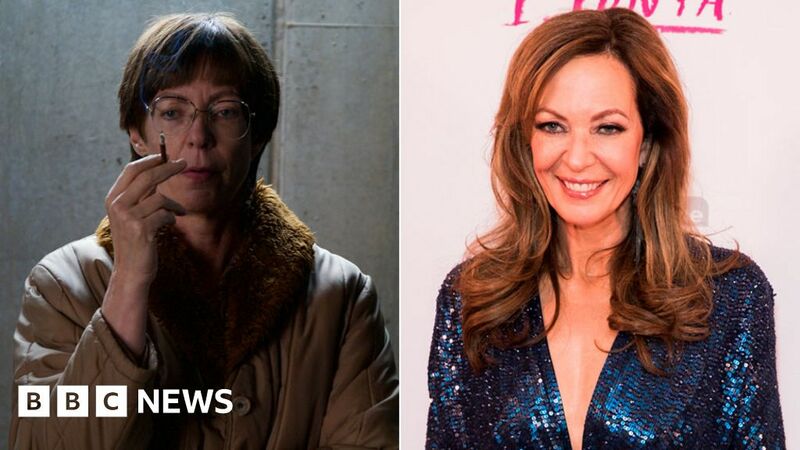 It was “incredibly liberating” to play an unappealing character in I, Tonya, Allison Janney has said. She’s tipped to win her first Oscar, as best supporting actress, for the role of LaVona Golden – mother of figure skater Tonya Harding in the film. Janney’s character wears a fur coat, and often has a bird perched on her shoulder – she says three had to be auditioned to play the pet. She also had to sit through three hours of make-up each day she was on set. Golden, now estranged from Harding, is depicted as a domineering mother who pushed her daughter to succeed – at all costs. The West Wing star Janney played her at different ages, including as an elderly woman giving an interview, staring at the audience directly. But instead of being upset at seeing herself as an older woman, Janney says she “loved it” and it made her feel more confident. “My look was incredibly liberating,” Janney told a London press conference. “I went through three hours of make up for the direct address scenes. The incredible wig and costumes – having that fur coat, auditioning three birds. “I felt so empowered by that look. I didn’t feel as horrified as I thought I would be – ‘I’m going to see myself look so old’. Margot Robbie plays Harding – the controversial skater, perhaps still best known for her connection to an attack on her rival Nancy Kerrigan in the run up to 1994 Winter Olympic Games. Robbie said she found the story, and the characters, stranger than fiction. “We tend to draw it in and not want to exaggerate when we’re portraying something on screen,” she said. “But actually, real life happens to be a lot more insane than what we do in the films most of the time. She said she also enjoyed playing someone who was far removed from herself. “I just need to not look or sound like myself in order to not feel like myself and be able to act like someone else,” said Robbie, who’s up for the best actress Oscar and also produced I, Tonya. “Hair, make-up and costume to me is a huge step. Janney added that the black comedy comes out of the stakes being so high for Golden, who was desperate for her daughter to achieve and be accepted – and the contrast between different characters’ accounts of the same situation. “When the figure skating community didn’t embrace her daughter, she was enraged,” she said. “I had to ground her in reality, flush her out so she wasn’t just a monster. “She was a woman who had probably been disappointed at every turn in her life. Probably a woman who was abused. “I didn’t get to speak to the real woman, but I approached her as any other role as an actress. She added: “The humour comes out of the juxtaposition of the different viewpoints, smashed up next to each other. It’s being complicated that makes Golden such a fascinating part to play, said Janney. “I love telling other people’s stories,” she said. “I love telling women’s stories. I have played a man before – but mostly, telling women’s stories. The more complicated and messier the better. I, Tonya is released in the UK on 23 February. The Oscars take place on 4 March.